SONOMA COUNTY, CALIF.,—The inaugural Sonoma County Wine and Tourism Marketing Meeting was held Friday, Jan. 23, to discuss the state of the tourism and wine industries in Sonoma County. Sonoma County Tourism, Sonoma County Vintners, and Sonoma County Winegrowers, also known as the Trio, consolidated the organizations’ annual meetings into one in front of a capacity crowd of nearly 700. Held at the Hyatt Vineyard Creek Hotel & Spa in Santa Rosa, the meeting recapped results from the Trio. In addition, there were updates from regional grape grower and winery organizations: Alexander Valley Winegrowers, Russian River Valley Winegrowers, Sonoma Valley Vintners & Growers Alliance, Winegrowers of Dry Creek Valley, West Sonoma Coast Vintners, and Wine Road of Northern Sonoma County. “All of us are collectively working together to promote Sonoma County as the premier Wine Country travel destination, the birthplace of world-class wines, and the first wine region in the nation committed to 100 percent sustainability in our vineyards and wineries,” said Karissa Kruse, president, Sonoma County Winegrowers. The three marketing organizations will be working with the Super Bowl 50 Host Committee to plan the events surrounding one of the biggest annual sporting events. 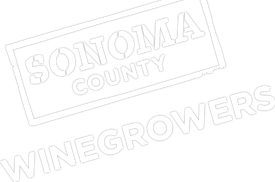 Sonoma County’s involvement includes providing wine for host committee events, reaching out to visitors and football fans to extend their stay in Sonoma County, promoting and educating consumers on the shared commitment to sustainability by both the Host Committee and the region, and connecting local businesses with potential customers. The Trio also collaborated on Sonoma in the City and Sonoma Wine Country Weekend. They also share public relations representation with a national firm in New York, as well as office space, in order to better market Sonoma County’s wines, vineyards and agriculture, and visitors’ experiences. Tourism is one of the largest industries in Sonoma County, employing 19,000 people – nearly one in 10 jobs. It results in more than $1.55 billion in destination spending and adds more than $97.3 million to government coffers in the form of taxes collected from visitors. Sonoma County Tourism also helped design and promote the first-ever Sustainability Business Week that took place in various locations throughout the county. The well-attended event gave businesses valuable information about sustainability programs available for businesses. The Vintners announced that Carolyn Stark will step in as executive director starting Feb. 1. She replaces Honore Comfort, who announced her resignation in September. Stark was most recently executive director for Sonoma County BEST, an initiative that promotes job growth and retention throughout the county. “This has been an incredible time of growth for our industry and I’m proud to have been involved,” Comfort said. “Carolyn will steer this dynamic organization into its next chapter. I look forward to seeing what the Vintners will accomplish under her leadership. Sonoma County Vintners also announced the launch of the Sonoma County Barrel Auction on May 1, 2015. This new initiative will attract hundreds of members of the wine trade and media to Sonoma County while supporting new wine marketing initiatives. This time last year, the Winegrowers announced an initiative to make Sonoma County the nation’s first 100 percent sustainable wine region by 2019. Since then, 43 percent of the vineyard acres in Sonoma County have gone through the sustainability assessment and 33 percent of the vineyards have taken the next step and are now certified sustainable under a third-party auditor program. Sonoma County Winegrowers also shared their new 100-year business plan to preserve agriculture in Sonoma County well into the 22nd century. The event included awards given to the Sonoma County Tourism Champion, as well as the top Certified Tourism Ambassadors (CTAs), a national professional program that strives to improve visitation by inspiring front-line hospitality employees and volunteers to turn every visitor encounter into a positive experience. A wine reception and an AVA and affiliate tradeshow were included. Bob Johnson, owner of the Bob Johnson Gallery in Healdsburg, was named the Sonoma County Tourism Champion. Bob is always willing to meet with travel writers, tour groups, meeting planners, tourists and any random passersby to engage with them about the arts. He is passionate about art and sharing ideas. With instituting his regularly scheduled gallery walk, he is instrumental in elevating Sonoma County as an arts destination. Central Sonoma County, Chris Morano, concierge, Fountaingrove Inn; Russian River, Art Costello, reservations manager, Russian River Getaways; West Sonoma County, Deborah Klein, director of sales, Sonoma Canopy Tours; North Sonoma County, Lorene Romero, owner, Sharp Tongued Consulting; Sonoma Valley, Wendy Peterson, executive director, Sonoma Valley Visitors Bureau. Sonoma County Tourism’s nominee for Tourism Ambassador Institute’s CTA of the Year, a national honor, is Deborah Klein, Sonoma Canopy Tours. Sonoma County, California, located just 45 minutes north of San Francisco, offers world-class wines from more than 400 wineries in 16 designated wine regions, cuisine featuring locally grown and artisan products, and destination resorts including 40 spas and 21 golf courses. It is the birthplace of premium California wine more than 150 years ago and home to approximately 60,000 acres planted to vines. Family heritage, community, and dedication to the land are what make Sonoma County a friendly first-rate wine and food destination. Editors: High-resolution photos will be available on Monday, Jan. 26. Contact Tina Luster, [email protected], for information on how to download the photos.